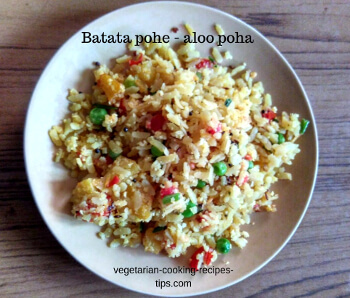 Batata poha or Aloo poha recipe is a popular, quick and easy breakfast recipe. It can also be served as a snack. Batata or aloo means potato. 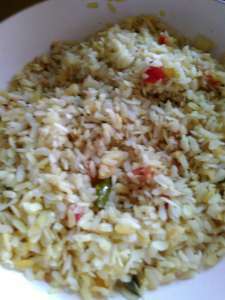 Poha or pohe is beaten rice or rice flakes. The combination makes a yummy, filling breakfast dish. It takes just about 10-12 minutes to make. Less time is needed if you have pre boiled potatoes ready. Even if you don't have boiled potatoes, it takes only 2-3 minutes to cook potatoes when you are making batata pohe. When you are in a hurry, go for aloo poha. Add poha / aval to a bowl. Add water to wash the poha. wash poha well by changing water once or twice. Remove excess water. 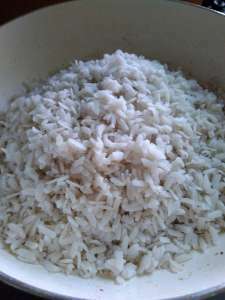 You may allow one or two tablespoonfuls of water to remain in poha. Keep aside. Peel and cut potato into tiny pieces or thin slices. You will need about 1/2 cup potato pieces. 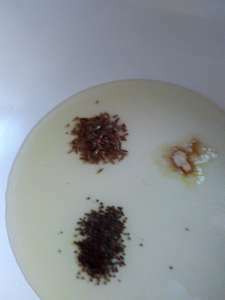 If using raw potato, keep in water till needed. Heat oil in a thick bottomed pan or a kadai. 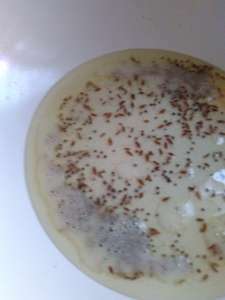 Add mustard seeds, cumin seeds and hing. Stir and let the seeds splutter. When they stop spluttering, add green chilies. 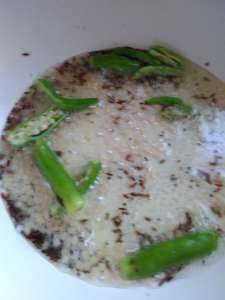 Stir well and let the green chilies fry for a minute. If using raw potato, add the cubes now and let fry for a minute. Cover and cook on a low flame, allowing the potatoes to cook in their own steam. 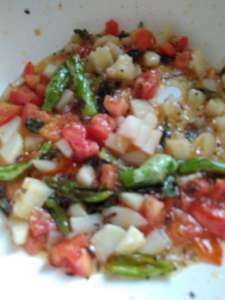 As I am using boiled potatoes, I will add them after the tomatoes are just cooked. Add chopped tomatoes (if adding). Add ginger - paste, chopped or crushed. If using boiled potatoes, add potato cubes (after tomatoes) and turmeric powder now. While the tomato / potato is cooking for minute, add salt, sugar to the poha bowl. If there are any lumps, break them. Mix well with a spoon. Doing this using your fingers is better. When the tomatoes and potatoes are just cooked, add the poha mixture to the pan. 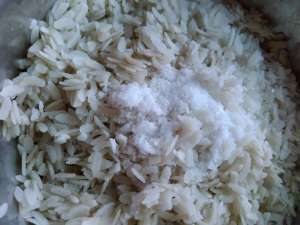 Remember, you have already added salt and sugar to the washed and soaked poha and mixed. 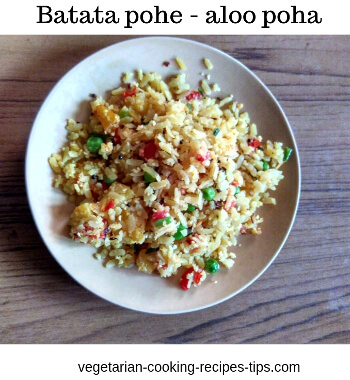 Mix poha well with the cooked potato mix. 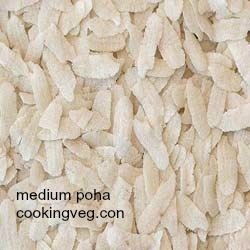 If poha looks too dry, add a tablespoon of water and mix. Cover and cook on low fire for 2 minutes. The vegetables are already cooked and poha doesn't take much time to cook. 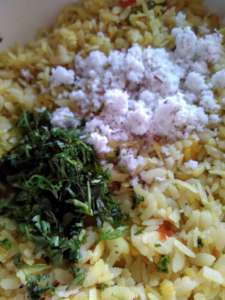 Add lime juice , chopped coriander leaves, fresh grated coconut. Aloo poha is ready to serve. Serve by itself or with a favorite pickle. Mango pickle or lime pickle goes well with batata poha. 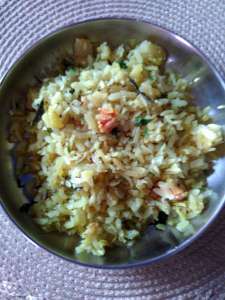 You may use thick poha instead of medium thick poha. You will need a little more water and will need to soak longer. Serve for breakfast or as evening snack. It can also be made and served when unexpected guests arrive as it can be made quickly. Instead of washing in a bowl, you may add poha to a colander and wash with running water and then keep aside. You can also add mixed vegetables - green peas, onion, capsicum ( all chopped) along with potatoes. Adding a teaspoonful of ghee, along with coriander leaves and fresh grated coconut, in the last step, adds good flavor to poha. Aloo Paratha - Potato Bread - Whole wheat flour flat bread stuffed with potato filling. Onion Upma - Onion and semolina dish - South Indian breakfast. 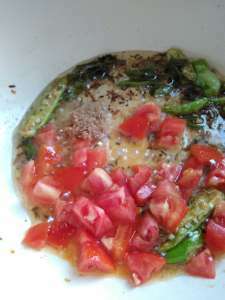 Mixed veg upma - Vegetables and semolina dish for breakfast. Uttapam-Uttappa - Indian / Vegan Pancake with onions/tomatoes served with chutney.